A special, practitioner led summer session took part as part of the alias tenth anniversary celebrations took place on at Westley Farm, Chalford. alias is an artist-led professional development organisation providing an advisory service for visual artists and networking opportunities. The experimental / experiential recording is provided here as a less formal model of dialogic practice. 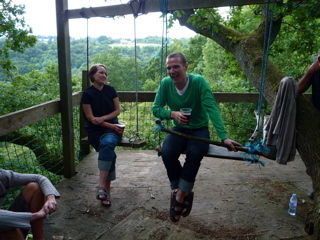 Only one participant – Paul Harper, one of the directors of alias – had a microphone, which he wore while tending bar, in a tree house, overlooking the Gloucestershire countryside. Listening in to the conversation through his viewpoint, the recording more closely resembles the lived experience of being part of a dialogue. Toward the end, Paul reflects on his experiences of formal panel discussions against the ‘green room‘ conversation before and after, both neatly ending the audio and providing an introduction to the point of the event. The dialogue ranged between discussions of individual practice, artistic careers, the education system, gossip and general bar chatter; a close representation to the informal manner in which most artists would be used to talking.